Seeing as Star Wars Episode VIII picks up immediately where The Force Awakens left off, it seems reasonable to expect the characters to look pretty much the same. Dramatic changes in costume or hair style seem unlikely, but smaller changes are still to be expected. 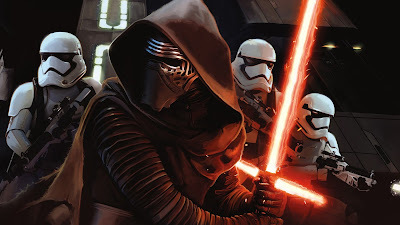 One character we can expect to see some subtle changes in their look is Kylo Ren. Our friends over at MakingStarWars.net have a description of Kylo's new costume we'll be seeing when he returns to the silver screen in 2017. While this does not delve into story details, fans who are trying to avoid all Episode VIII spoilers may want to stop reading now. This is your SPOILER ALERT! "I have it on good authority that Kylo Ren continues his Darth Vader obsession well into Star Wars: Episode VIII. While his mask is very much the same mask he wore in Star Wars: The Force Awakens (with some minor tweaks and revisions), Kylo’s robes are somewhat different. The best way to describe Kylo Ren’s under-robe is that it is sort of like the black costume Luke wore in Return of the Jedi. However, the notable thing about the costume is the cape itself. According to sources, Kylo Ren is wearing a Darth Vader cape in Star Wars: Episode VIII. The cape is said to be like the one Darth Vader wears in The Empire Strikes Back/Return of the Jedi. However, the cape does not have the same chain clasp. It is not entirely clear if this cape is one Kylo made to resemble that of his grandfather’s or if he actually procured one of Darth Vader’s capes that probably fell into the hands of collectors in the Star Wars galaxy." It's interesting to see Kylo's fascination with his grandfather continue into Episode VIII. Based on MSW's report, my guess is that this will be one of those connections the audience has to make on their own and won't be explicitly stated in the film that Kylo is emulating his grandfather any more than he already was in The Force Awakens. MSW does promise more details about Kylo's costume are coming soon, so hopefully they will shed more light on this. Well i think they told him that . But Kylo Ren said :" He was weak and too sentimental,he did the wrong thing , and I will finish what he started , his path through the dark side ! I'll become more powerful than any force user ever dreamed!"